A CD of our favourite songs has been recorded, sponsored by the Rutland Lions Club. Councillor Adam Lowe adopts Rutland Reminders as his charity during his year of office as Mayor of Oakham. 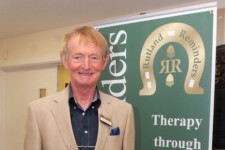 Rutland Reminders Chairman, Dr Charles Lawrence, has received an Inspired in Rutland Award from the British Red Cross.